"These moist muffins are really small, that's what makes them cute! The spiciness makes them delightfully delicious!" Preheat oven to 350 degree F (175 degrees C). 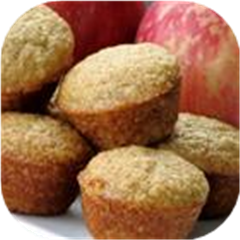 Line a mini muffin pan with paper liners. In a large bowl, cream together the butter or margarine and sugar. Add eggs, and beat until smooth. Blend in cinnamon, allspice, baking powder, and baking soda. Alternately add in a half cup of applesauce, one cup of flour, remaining applesauce, and remaining flour. Stir until just blended together. Pour batter into muffin cups 2/3's of the way full. Bake in preheated 350 degree F (175 degrees C) oven for 17 minutes.